Calories - Shake - 303kcal. 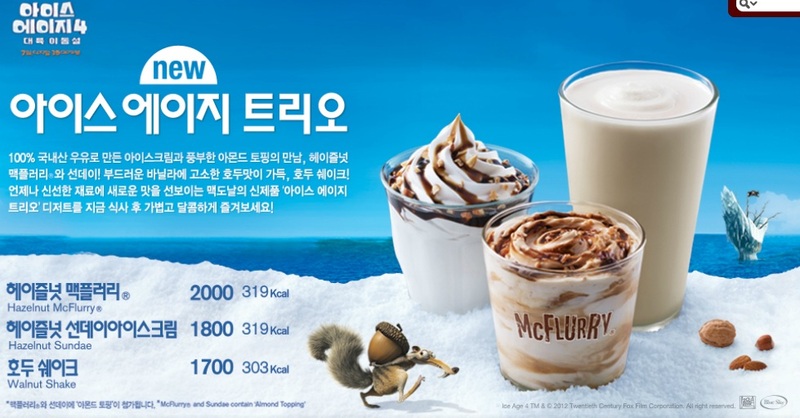 McFlurry - 319kcal. Rating - Click the link below to read the review and see the rating. 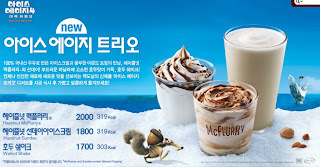 I always assumed to myself that McDonald's Korea would have introduced their first promotional item of the year, the day after I moved away (scheduled leave Korea the last week of June), but one morning I checked the McDonald's Korea website one morning and saw that not only are they bringing back free glasses with 'large' combo purchases (I had 2 from the last time they did this during the World Cup, but I have since broken them), but they also are introducing 3 new ice cream items to promote the film Ice Age 3, also just in time for the humid Korean summer. Each of the new promo flavours are a 200-400W premium over the standard flavours. I don't know if that is because Koreans happily pay ridiculous prices for nuts in the grocery stores, so they figured they could price gouge, or they wanted to make these look like they were slightly higher quality than the others. Regardless of their motives, when my girlfriend and I entered the branch,(which is a good ways outside of Seoul proper) at around 2pm , it was still packed. Most people were getting a combo for lunch, but it seemed like a good percentage of those people were also ordering some ice cream. We decided to try the Hazelnut McFlurry, and the Walnut Shake, skipping the Hazelnut Sundae as we didn't need more ice cream, and one Hazelnut item was enough. As happy as she looks in that photo, we both felt the McFlurry was disappointing. We both thought the Hazelnut McFlurry would be better than it was. First off, if you look at my photo at the top of the post, you can see that I only received half a cup of ice cream. It didn't look very appealing either, so we decided to try it first before going to complain. After we both tried it, we decided it was better off in the bin rather than trying to ask for the other half of our ice cream. The hazelnut flavouring tasted horribly artificial, and the nut pieces on top were not even hazelnut, but rather almond. When I mentioned to her about the new ice cream items a few days earlier she pulled a face when I said there was a 'walnut shake' and personally, I didn't think it was going to be that good either, but it surprised us both. Unlike the McDonald's shakes my father used to get in Canada which were like a rock and you pretty much needed a spoon to eat this was soft and milky. I guess that it has 1/2 the calories of the Milkshakes back in Canada makes a big difference with the amount of ice cream used, but we both enjoyed it. The walnut flavouring was subtle, but enough you could figure out what it was, and it didn't seem watered down. Whereas we threw away half of the McFlurry we fought over who would finish the shake, so I guess that's a good enough review as any.